Ever wondered what it would be like to live at the bottom of the ocean? The seas and oceans and other bodies of water all around our planet are teeming with incredible life and stunning scenes, but so much of the aquatic world seems totally inaccessible. Scuba diving and snorkeling tours and expeditions at vacation destinations all over the globe give us a little taste of what life is like beneath the waves, but they often leave us wanting more. If you've ever tried diving or snorkeling yourself, you might have wished an expert was on hand to tell you all about the various forms of marine life you managed to spot along the way or teach you all about the various ecosystems in place throughout a coral reef. You might also have wished you could go further out to sea or deeper beneath the waves in search of greater adventures and bigger animals, but typical diving and snorkeling tours tend to be quite limited. Well, with the Go Deeper Expedition from the Marine Megafauna Foundation, you can break through those limits and enjoy a diving adventure that is simply unmatched anywhere else in the world. Running in June and August of 2019, this outstanding opportunity for aquatic exploration will take place in the waters of Mozambique and give you and your fellow passengers a deeper look at a watery world. Dedicated to protecting the oceans and the gentle giants who live inside them, the Marine Megafuna Foundation does a lot of great conservation work, with its ultimate goals being to save threatened species, research ways in which the oceans can be protected, and work towards a world in which mankind and marine life can live together in total harmony. As well as organizing various research and conservation projects and initiatives, the Marine Megafauna Foundation also provides expeditions to those interested in diving down beneath the surface and learning valuable, exciting, educational information about what's really happening in Earth's oceans and seas. The Go Deeper Expedition is a prime example, and it really lives up to its name, not only plunging deeper down beneath the ocean's surface than any diving trip you ever tried before, but also by offering deeper experiences, deeper levels of knowledge, and deeper emotions for all guests. What Is The Go Deeper Expedition? The Go Deeper Expedition, as its name suggests, is an underwater expedition organized by the Marine Megafauna Foundation, with the core concept being all about going deeper than you've ever gone before. As previously stated, this expedition will be taking place in Mozambique and allow you to dive down with an experienced marine biologist. This means that not only will you be able to get up close and personal with all kinds of magical marine life, you'll also be able to learn all about it in scientific detail from a leading expert. All guests on the Go Deeper Expedition will enjoy so many experiences and learn a lot along the way, making this trip so much more valuable and interesting than a standard scuba diving tour. 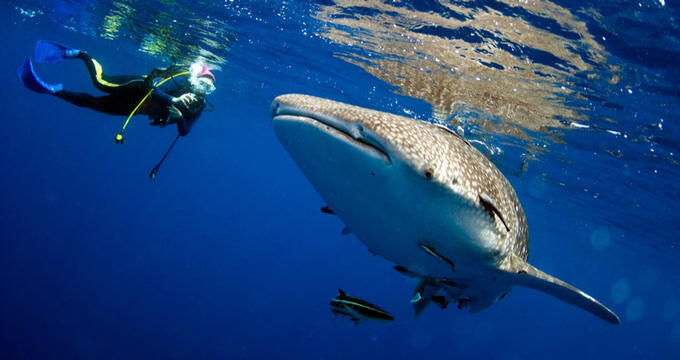 You'll get a chance to admire and observe all kinds of ocean giants like sea turtles, manta rays, whale sharks, and more. You'll be taught all the ways to distinguish between the genders of each species, as well as discerning their age, becoming a bit of a marine biologist yourself in the process. You'll be able to take photos and learn about the various aspects of marine biology, as well as identifying individual animals based on their markings and patterns, and enjoying evening presentations to learn so much more about the animals you're encountering. Anna Flam, leading research biologist with a major specialization in manta rays, will be right there with you to help you learn all about the various aspects of manta ray life, as well as sharing her expertise on other animals and regaling you with stories from her incredible career as a leading MMF biologist. Each Go Deeper Expedition will only feature a maximum of eight guests, as well, so you'll be getting a very personal, private, intimate experience without any big groups crowding you out or making the trip feel too busy. With small groups, you'll be able to forge friendships with other guests and get plenty of time to speak with the expert guide, asking questions and getting the answers you need. Not only that, but the funds raised by the expedition are all going back into helping MMF continue to organize research and education projects focused on saving endangered species, protecting the oceans, and making the world a better place, so you'll be contributing to an excellent cause as well as enjoying a once in a lifetime experience. Interested in signing up and setting off on the Go Deeper Expedition yourself? If so, there's some important information you'll need to know. There are two Go Deeper Expeditions set to be held in 2019, with the first running from June 15 to June 23 and the second running from August 17 to August 25.